Tarifa offers many tourist alternatives apart from the traditional cliche of sun and beach. Tarifa is surrounded by the Atlantic Ocean and the Mediterranean Sea and it also has the Strait of Gibraltar separating two continents: Europe and Africa. Begin our creative tourism visit at the Tarifeña fish factory. There they elaborate their products in a total artesenal way. In the first stage, the Andalusian mackerel is cleaned and washed until no blood can be seen. Then they are boiled in brine without chemicals to get the optimum temperature (0 y 4ºC). 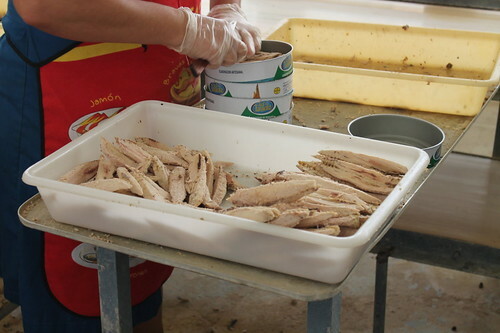 In the next stage, skilled workers peel the fish only with a knife very fast. It is incredible seeing how they fill the tins wasting almost nothing. Their productivity is amazing. Later the machines fill up the mackerel tins with sunflower or virgin oil. Finally, the products are sterilized and ready to be labeled and distributed. Employees peeling very fast the fish. They are so skilled. 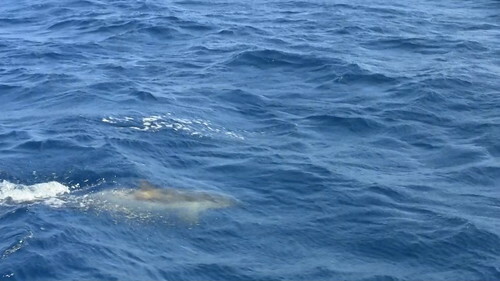 Before my cookery creative curse at Sillos 19, I hop on a boat to watch dolphins and whales at the Strait of Gibraltar. Tarifa due to its location is a perfect spot to observe migrations of those aquatic mammals but it is also a place for bird migrations too. I rather watch animals in their habitat instead of a prison such as aquariums or zoos. It is pity, I saw the dolphins but the whales did not show up, may be next time. I arrive at restaurant Sillos 19, where Chef José Luis prepares paella and sea bass in salt crust. Cooking paella, I discover few things that I write down: 1) do not use onions, 2) make use of king prawns ´shells for the fumet mixed with vegetables (broth paella). During the curse, I also learn about one pepper from my country I did not know. Its name is ñora, a red and dry pepper which gives sweet flavor. Both meals are delicious and they taste even better because you have cooked them. Yummyyyyy!! 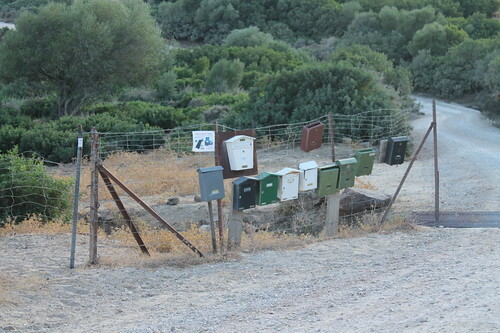 In the hills of Puertollano (30 minutes away from Tarifa) lives the wind miller Juan Gil, famous in the region because of his macho bread (whole meal bread). Finding the place is a little bit difficult as the GPS does not show up the address on the screen. The only way to get there is by asking the locals. Juan shows me the water mill, the wood oven, and the room where he makes with his hands the whole meal bread. He gets up every day at 4am to work its macho bread and delivery it to the region of Tarifa. Back at Tarifa, Daniel Vallejo welcomes me at his workshop. He makes and repairs surfboards and kite surfs. Daniel shows me the mains steps to produce a surfboard: draw the marks on the board, polishing and the design. The process is quite long as the board needs time to dry after painting the design. Daniel is also an instructor of surf and kite surfing. Here you can watch the video of my creative trip to Tarifa. This entry was posted in Travel Posts and tagged #Spain, #Tarifa, Creative Turism, Pan Macho, Tarifeña FIsh by Maximo Perez. Bookmark the permalink.